As we sit at lunch on the western shore of the Atlantic, 10 months to the day we toast with pleasure our experience with Nicole and Niso Wine Tours with a bold, golden Kyrie from Cloisters de Siurana. Two phrases describe our trip: knowledge and accommodation. Nicole commands a knowledge unique in our experience of someone who genuinely knows the science of wine and marries that with the pleasure of the sights, tastes and people. 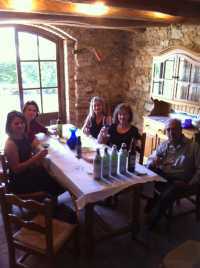 She is respected and appreciated by the vintners and individually tailors the tour to include your needs. Our three day wine tour encompassed the full choices from boutique to cooperative to family crafted wines all with the knowledge that enhanced our trip. Accommodation only begins to describe what Nicole arranged for our tour…whatever we needed or wanted to do from local color at a village bar to the gastronomic lunches to the side trips for olive oil tasting and 12th Century monasteries, was arranged. As we are poised to open our second Priorat of the day, a bright but young Idus from Val llach, we thank Nicole and Niso Wine tours for our introduction and continuing enjoyment of the Spaniard viticulture. Hope all is well and photos emailed separately.